Kippy Schofield was almost ten years old. He had large ears that stuck out, freckles, buck teeth, thin brown hair and a skinny body. Kippy was an ordinary boy with an amazing life; he lived in a large rambling house on the beautiful island of Hawaii. He shared each day with his friends, big brother Scotty and his parents. Kippy enjoyed swimming with the turtles in the crystal clear lagoon, playing with his friends and, on occasions, going to school. One day a letter arrived. Everyone was excited when Scotty was accepted into Oxford University. Changes happened. The large house; the only home Kippy had ever known was closed, and Alba, Kippy’s beloved housekeeper, left behind. Kippy travelled, for the first time on an aeroplane, visited the bustling city of Honolulu and then boarded a larger plane where he slept the entire flight to London. The death of his dad was soon followed by his mother leaving to travel around Europe. Shortly afterwards, Scotty left for University. Then, one stormy night, the ugliest woman Kippy had ever seen blow into his life. Her name was Nanny B. Meane, and that’s exactly what she was! Meane by name, mean by nature; and proud of it! Kippy’s world went from sunshine to darkness the moment the fat, despicable Nanny entered his life. She never bathed, never cooked and never took her eyes off TV unless, tormenting Kippy. Kippy’s fell quickly into despair. Until, he discovered Scotty’s magic rock at the bottom of the garden. Then, he was taught many exciting lessons. It was when he was sitting on that same rock that he first glimpsed the Fantastical Cat. She introduced Kippy to another world. In her world Kippy was schooled with the hedgehogs, danced with the moles and accepted into the exclusive ‘boys club’. It was also where he met Fergus Barnes, and from that moment on, Kippy knew he had two wonderful things in his life. 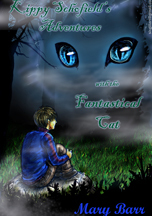 The beautiful Fantastical Cat and, Fergus Barnes his new best friend.